Fertilizers are commonly injected into the irrigation water of microirrigation systems, a process called fertigation. Injection of fertilizers, however, can cause clogging problems in the emitters. Anhydrous and aqua ammonia. 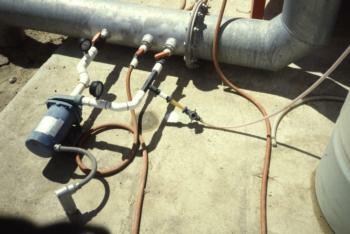 Injecting anhydrous or aqua ammonia increases the pH of the irrigation water. If the pH increases to more than 7.5 and if the irrigation water contains at least 2 meq/l bicarbonate, calcium carbonate can precipitate. Calcium. Injecting a fertilizer that contains calcium (e.g., calcium nitrate) into irrigation water that has more than 2 meq/l bicarbonate and a pH greater than 7.5 may cause calcium carbonate to precipitate. Sulfate. Injecting a fertilizer that contains sulfate into irrigation water that has a calcium concentration of more than 2 to 3 meq/l, may cause calcium sulfate (known as gypsum) to precipitate. Phosphorus. Injecting many fertilizers that contain phosphorus may cause a reaction with calcium and magnesium in the irrigation water, causing phosphate precipitates to form if the calcium or magnesium concentrations are higher than 2.5 meq/l or 40 to 50 ppm. These precipitates can be difficult to dissolve out of emitters. To prevent phosphate precipitates from forming, growers sometimes use phosphoric acid for fertigation. However, sufficient acid must be added to lower the water's pH to 5 or less. The amount of acidic phosphorous fertilizer needed to reduce the pH of the water may greatly exceed the amount needed for fertilization. For more information on fertilizer mixing reactions, click here.